Marking the 'Year of Zayed', a unique 'Reciting one million Surah Al Fatiha' initiative was launched in the UAE capital. Sheikh Kanthapuram AP Abu Bakr Musliyar, general secretary of All India Muslim Scholars Association, launched the initiative dedicated to the UAE's founding father, the late Sheikh Zayed bin Sultan Al Nahyan. Abu Bakr noted that Sheikh Zayed always sought love and harmony in the world. "The UAE's Founding Father was a beacon of hope. He promoted the message of peace and tolerance. 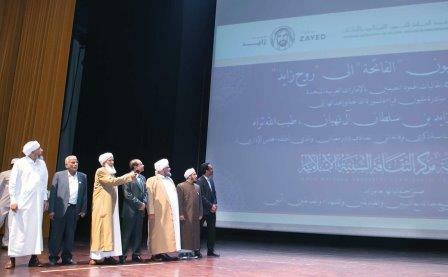 On the occasion of the 100th anniversary of the birth of the late Sheikh Zayed, the Jamiaa Islamic Sunni Culture Centre has adopted the 'Reciting one million Surah Al Fatiha' initiative," Abu Bakr said. "This will help to raise awareness among the community about the noble help extended by Sheikh Zayed to the people of India and its charitable institutions. The Kerala-based leader lauded the contributions made by the UAE leaders in his home state. "The help in various sectors are highly commendable." He added: "Sheikh Zayed was the main source of inspiration for Islamic institutions in India and it's a legacy that lasted for the past four decades. Sheikh Zayed has made remarkable efforts to achieve the principles of peace and security not only in the GCC, but throughout the world. he has made significant contributions in spreading the values of unity and brotherhood worldwide." Meanwhile, Dr Mohammad Farooq Al Naeemi, UAE President's Ramadan guest scholar, said the UAE is following an apt religious approach to a multiethnic, multi-religious society. Community leaders like Indian Islamic Centre president Bava Haji, LuLu Group chairman Yusuff Ali MA among others were present at the event at the launch.